ESPN writer Tim Bontemps anointed the Philadelphia 76ers new starting 5 players The Phantastic 5. 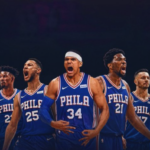 With the addition of forward Tobias Harris, the 76ers starting lineup of Jimmy Butler, Joel Embiid, Ben Simmons and JJ Redick has won the last two games and causing a stir in the Eastern Conference. The Alliance of American Football (The Alliance) debuted on Saturday. This new football league is billed as a minor league for the NFL and a way to watch competitive football in the off-season. We’ll see a few famous coaches such as Steve Spurrier, Mike Martz, Rick Neuheisel and Mike Singletary as well as some former college and NFL players including Penn State’s Christian Hackenberg and Michigan quarterback Denard Robinson.